Only three times in MLS history has the Cup champion won the title the following year. The Sounders are looking to become the fourth, but many challenges, both emotional and logistical, await. The Seattle Sounders are on a mission to become the first club to repeat as MLS Cup champs since the LA Galaxy did in 2011-12, and just the fourth team to do so since the league began in 1996. The goal of avoiding giving the 2016 championship run the appearance of flukiness is complicated by the peculiarities of MLS. In the past decade, no team that won the MLS Cup (other than LA’s repeat) has made it to its respective conference final, let alone the championship game, the following season. The Portland Timbers, who won in dramatic fashion in 2015, set the benchmark for title-defense mediocrity the following season: Winless on the road to finish with 44 points, a 10-year low for the 34-game schedule (the old schedule played 30 games). Though comparisons between the Timbers and the Sounders will always prove irksome to diehard fans, the clubs’ proximity and mutual level of visibility mean that Seattle can take lessons from Portland if it wants to avoid the same embarrassment that befell the Timbers in 2016. Ahead of its home opener Sunday against the New York Red Bulls (4 p.m., FS1) Seattle will need to make CenturyLink Field a fortress, because the MLS road is harsh. The Sounders were 10-5-2 at home in their championship season, and are unbeaten at home (5-0-2) under head coach Brian Schmetzer. Though feckless on the road, the Timbers posted a franchise-record 12 wins at Providence Park in 2016, adding three draws for 38 points that kept the title-holders in playoff contention until the season ended in a disastrous 4-1 loss at Vancouver on the final day. 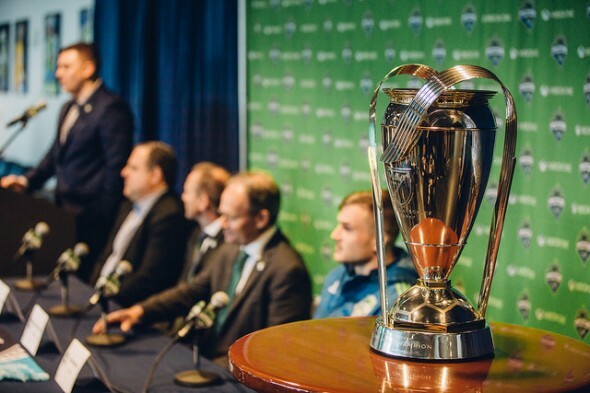 Travel concerns will always be an issue for all Cascadia teams except among each other. The Sounders will travel roughly 22,400 miles for their 17 away matches this season, an average of 1,318 miles per contest. The Pacific Northwest’s location on the periphery of the continent may make for beautiful scenery, but the travel picture is decidedly ugly, as it is for all the region’s sports teams. Western Conference teams (which have won eight of the past 10 MLS Cups) are at a disadvantage to Eastern Conference teams during the regular season. The West stretches from British Columbia to southern California, east to Texas and, with the inclusion of expansion franchise Minnesota United, to the upper Midwest — 11 teams across three time zones that all visit one another. The Eastern Conference has one team in the Central time zone: The lowly Chicago Fire, which has made the playoffs once in the past seven years. The rest play in the East, mostly tightly packed into the Northeast and two in eastern Canada. Travel is complicated by restrictive MLS rules about how a team can fly. Stemming a desire to keep rich club owners from lavishing their players with better treatment, the league has long imposed a rule that no more than four legs of travel can be by charter flight during the regular season. For the average traveler, delays, making connections, cramped conditions in coach and the never-ending battle with the guy next to you for the armrest are part of the deal. For pro athletes, those same factors become an active hindrance to the ability to perform the physical job, particularly as stresses of a season wear on. Teams in all the other major American pro and college sports typically charter. Schmetzer, never one to pin a team’s shortcomings on anything but itself, thinks the biggest factor in repeating comes down to players buying into the club’s philosophy and drive, rather than looking at the game as just a job. “’Nobody really cares what you know until they know that you care,’ is one of my favorite quotes,” Schmetzer said Friday. “They’ve got to know that you care. Getting the message to them that it’s their team. They do the hard work. After a lethargic debut in Houston—something Schmetzer said helped jar the team from complacency—Seattle ground out a late draw on the road in Montreal. The team is trending in the right direction. But a shot at repeating as champions will require a measured approach, excellent medical care and a combination of starters and depth players contributing early and often, not just in the frenzy of October. By the end of the decade, MLS has got to require charter flights for all teams. With the growing expansion fees, the owners should be able to afford all charters, and smoother travel for the traveling parties is much better for the players’ well-beings during the long season. As for Portland’s stumble last season, I think that was from both teams targeting the champs, and from their 2015 style backfiring in 2016. From what I saw, they relied on getting an early goal, parking the bus, and settling for a draw if they couldn’t maintain the clean sheet. In that strategy, conceding twice meant they were in big trouble, and couldn’t dig themselves out of it enough last year. There was also a depletion of the back line (the loss of Nat Borchers to an early Achilles tendon tear was particularly brutal) and from their new signings not really panning out (Steven Taylor, debuting with Timbers 2, notably notched an own goal within nine minutes). It’s generally agreed that charter flights could have been accomplished during the last CBA, but the players wanted to push for free agency (which they only got in a limited sense). I imagine in the next round of negotiations players will probably stand their ground on charter flights, especially as the overall talent level (and cost) of depths players in the league rises through the use of allocation money.